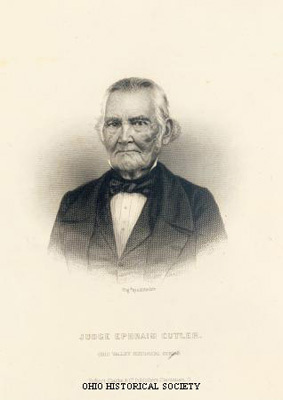 Engraved portrait of Ohio pioneer Ephraim Cutler (1767-1853). The Coonskin Library was founded in 1804 in Ames, Ohio. It was one of the first circulating libraries in Ohio. Money was scarce in Ohio, so several residents of Ames accumulated furs. An agent for the town sold the furs to Easterners and then used the money from the sale to purchase books. Most of the furs were from raccoons, with a small number of skins from bears and wolves. The town entrusted Samuel Brown with the furs. In 1803, he traveled to Boston, Massachusetts, to sell the furs. The furs brought the town seventy-four dollars to spend on books. This was a substantial amount of money in 1803.From a list provided by Manasseh Cutler, Brown purchased fifty-one texts. They consisted mostly of encyclopedias, historical and religious texts, and works of the Enlightenment philosophers. The library opened its doors on February 2, 1804. Its official name was the Western Library Association. Most people referred to it as the Coonskin Library since raccoon furs provided the money necessary to begin the library. The library's holdings grew and included several hundred books by 1830. The Ohio History Connection now holds most of the original volumes. The Coonskin Library was not the first library in Ohio. At least two other libraries had been founded before Ohio became a state in 1803. Israel Putnam started a small library at Belpre in 1795. In 1802, Governor Arthur St. Clair and twenty-three other Cincinnati residents established the Cincinnati Library. To check out books at all three of these libraries, users had to be subscribers. This meant that they had to provide donations for the upkeep and the expansion of the libraries. They sometimes had to pay a yearly fee as well. These charges kept many Ohioans from being able to use these libraries.